Pizzagate accusations spread to Austin, New York. 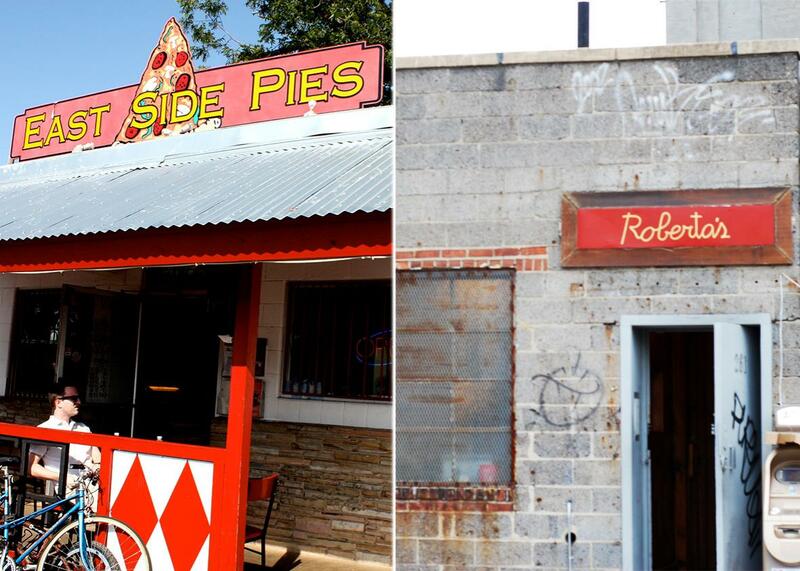 East Side Pies in Austin, Texas, and Roberta’s in Brooklyn, New York. Photo illustration by Slate. Photos by Kari Sullivan/Flickr and Howard Walfish/Flickr. DNAInfo writes that an employee of the Brooklyn pizza restaurant Roberta’s received a telephoned death threat after it was identified as a hub of satanic activity in a YouTube video posted by an individual who made similar claims about a restaurant in Amherst, New York, which is near Buffalo. As Slate’s Christina Cauterucci and Jonathan Fischer wrote Tuesday, part of what seems to have made Comet pizza a target of the far-right white nationalist crowd is that it has long been a welcoming environment for “eccentrics, queers, outsiders, and their art,” hosting punk shows and art installations. East Side Pies and Roberta’s are both also located in predominately liberal areas with thriving music and arts scenes. An oddly disproportionate share of the tweets about Pizzagate appear to have come from, of all places, the Czech Republic, Cyprus and Vietnam, said Jonathan Albright, an assistant professor of media analytics at Elon University in North Carolina. In some cases, the most avid retweeters appeared to be bots, programs designed to amplify certain news and information. The elder Flynn nonetheless continues to retain his position in Trump’s inner circle.